Nitecore was established back in 2007 by a company called Sysmax, which was only a few years old themselves. Sysmax created flashlights and began out on the path of innovation. Wanting to create flashlights that were more advanced and technical, Sysmax birthed the Nitecore brand. Since Nitecore was started in 2007, they have been a member of PLATO (Portable Lights American Trade Orginization), and product great products and great pricing. Like the other Nitecore products, the Nitecore EA4 Pioneer flashlight is perfectly suited to any and all needs you may have around the house, camping or any task in-between. Touted as the world’s smallest, lightest and brightest flashlight ever, the Nitecore is one toughly constructed utility. Most flashlights today are small and weak, or big and bulky. Recently, designs have been getting smaller and more convenient, ranging from pocket flashlights to button lights. Most of these fail to deliver the power, durability, or both needed to be totally practical in everyday situations. When you’re asleep at night and you hear a “bump” in the night, you reach for that flashlight closest to your bed. Usually, its a smaller flashlight that can easily be stored on top of the end table. As dark as it gets during nighttime, the little flashlight most likely on your night stand right now isn’t going to allow you to see all you need to see. 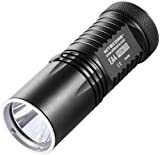 What flashlight on the market today can boast of a 4.6 inch long, 1.65 inch wide light, that can produce an amazing 860 lumens of darkness-dispersing light? That’s as much brightness as the newest and most technologically advanced LED light bulbs at half the width. Many of the flashlights available today just cannot stand up to what this Nitecore can. The Nitecore EA4 Pioneer is fully submersible in accordance with IPX-8 (up to 2 meters) so dropping it into a sink full of dishwater, in a puddle or in a shallow pond will not be an issue and render the flashlight useless. The beam has a “throw” distance of up to 283 meters and a peak beam intensity of 20,000cd. For a light its size, those are certainly huge numbers. But what makes this little flashlight unique is not only the ability to change the brightness with 8 rapid switch brightness modes, but also the ability to show approximately how much life the light has with a patented integrated power indicator light that displays remaining power, plus exactly how much battery voltage is left with a secondary function (accurate up to 0.1v). The bulb itself is a CREE XM-L U2 LED. The light utilizes a patented innovative single button two-stage switch, that offers a user-friendly interface. It also has a nice feature that reverses polarity if the batteries are accidentally put in backwards. It’s integrated with “Precision Digital Optics Technology” which gives it extreme reflector performance. Unlike most flashlights, it is impact-resistant up to 1.5 meters due to its construction. The outer casing is made of aero grade aluminum alloy, hard-anodized to a sturdy HAIII military-grade. The glass is tough mineral with an anti-reflective coating. It has a tail stand capability which allows working or looking hands free. Its touted to be able to have a ridiculous continuous run time of 22 hours due to its high efficiency circuit board. It does come with a quality holster, so it doesn’t have to be stored in-pocket. Other accessories it comes with are a spare o-ring and a lanyard. Optional accessories for the Nitecore EA4 Pioneer include anintellicharger i4, which eliminates the need for multiple chargers due to it’s ability to charge all kinds of rechargeable batteries; a filter for different colored lights; silicone grease to keep it lubricated; a diffuser and a traffic wand. Bottom line: This is one of the best flashlights of its kind. super compact, rechargeable, and huge amounts of power. Although it is made by a very new company, this torch has made a statement that will last for a long long time.